Food is a big part of Italian life and therefore a big part of traveling. 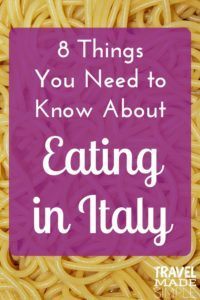 There is no way a single post can encompass an entire food culture, but here are some bits that I have learned over my trips to Italy. 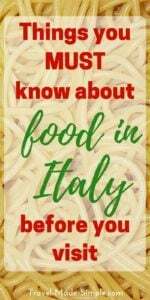 Since food is probably a big part of your Italy itinerary, this should help you understand a little more about eating in Italy and bit about the food culture. Freshness of ingredients is highly prized. That means regional foods that are in season. 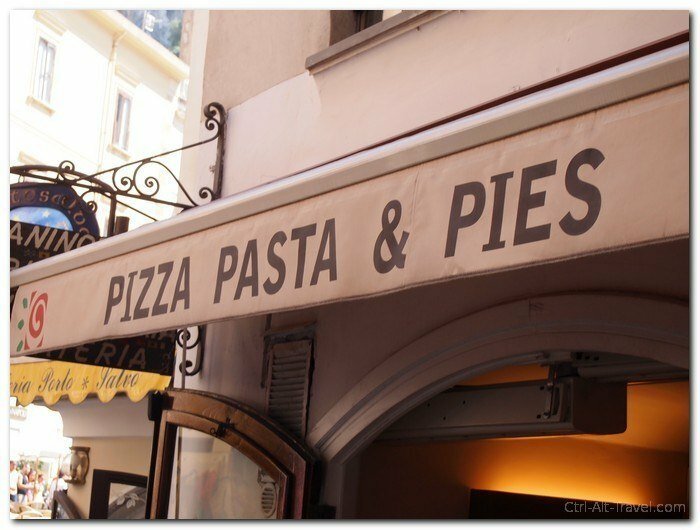 The basic staples you think of as Italian food are nearly everywhere, but pizza is different in Rome than in Naples, and the pasta dishes have their own regional variations as well. Some regions are known for things and it is worth hunting those things out. The sauce known the world over as Bolognese (we have seen it even in Thailand) is indeed from Bologna, but called Ragu there. It is also only served on tagliatelle (wide flat noodles), not spaghetti. Pizza may be famous in Naples, but I found it less interesting than the thinner crispier version we encountered in Rome. Ask your hotel, hunt the good spots, and try to see what the local Italians are eating. Breakfast is a light meal in Italy. No heavy eggs or bacon. Even in hotels you will find bread and pastries and not much more. 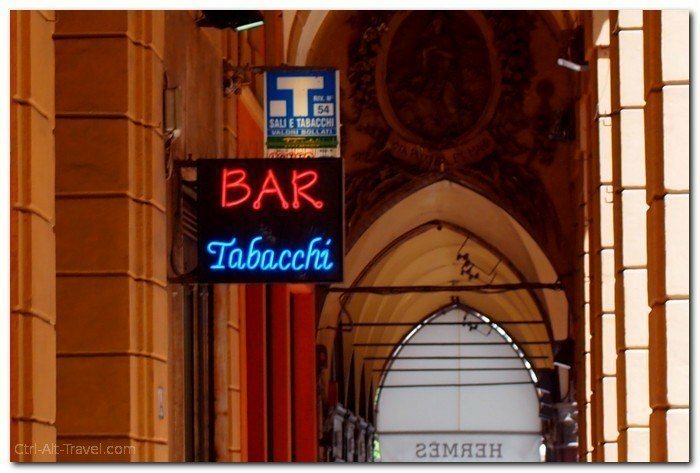 As you walk through cities in Italy you will notice a profusion of small places labeled “Bar”. While you might think they just love drinking in Italy, these are quite different. They are open in the mornings and I seek them out for coffee and brioche for breakfast. This is a normal Italian morning meal and shouldn’t cost you more than a few euros if you stand at the counter. If you want to sit down, it will likely cost you more. Brioche (bree-osh) is one of a plethora of small pastries found at a Bar. Often it is a croissant with a filling like Nutella or apricot jam. Wine is of course common across Italy, though coffee puts up a good fight for being the national drink. 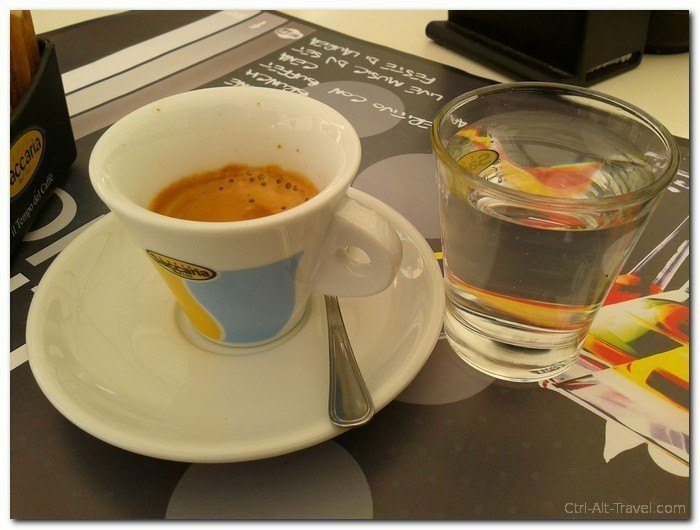 Breakfast seems to often be only a tiny cup of high octane coffee for many Italians. After dinner also brings coffee. This is so normal that I often feel waiters look at me like I am strange when I don’t want a coffee after dinner an hour before bedtime. Cappuccino is a morning thing, don’t try to order it in the afternoon. “Cafe” is strong and comes in small cups more akin to espresso than the large cups of coffee in the US. Often it is served with a small glass of cold water. Cafe Americano is espresso with extra hot water in it. In many sandwich places, you will be expected to order and pay for your food at a separate register. The attendant takes your money and gives you a receipt which you present at the food counter for what you want. This can get confusing, but it does mean that the person touching your food is not touching money. A normal Italian menu has several sections, and while I certainly can’t give you a compete Italian dictionary for food, here is a bit of description of the sections. After all, food is an important thing to know about before you visit Italy. Primi – First courses, usually pastas are here. Secundi – Meat plates often show up in the second courses. Don’t expect anything with that meat. Contorni – Side dishes like potatoes. Menu – The word ‘menu’ means several courses together. It is sometimes completely fixed, but often you get a choice for each course and drinks or coffee all for a specific price. Pizze – Pizza is singular, pizze is plural in Italian. Pizzas almost always end up in their own section and will be a long list of pizzas with different toppings. Dolce– Sweets, so dessert. Don’t be surprised to see cheese plates as a dessert item. Like the rest of Europe, there are no refills on drinks at restaurants. The sizes may even be smaller than you expect. These two little letters can be the difference between a large meal or exactly what you want. ‘e’ means ‘and’; ‘o’ means ‘or’. This is especially important to know when reading a “menu” offering of several dishes where an option and a combination are common. Eating in Italy might take place at different times than you’re used to. Lunch time is late, dinner is later. It’s almost impossible to find restaurants open and ready for dinner earlier than 8pm. Dinner will likely take a while especially if you do several courses. Relax and enjoy it. Eating too fast is bad for digestion. If you’re too hungry to wait until 8pm for dinner, try Apertivo. Apertivo deserves its own section. It may not exist in the same form everywhere in Italy, but where you find it, an Apertivo can be a grand thing. Apertivo time is several hours in the evening before ‘proper’ dinnertime, so roughly 6pm-8pm, where certain restaurants will offer food with your drink. This can range from a bowl of chips to a small buffet with a several types of cheese to large buffets that rival a meal. If you go to the student city of Bologna, trying Apertivo is a must. For the (only slightly inflated) price of a drink (often alcoholic) you can have something to eat. Definitely look at what other people have on their tables and spy out the bigger buffets if you want to have it as a meal. This is an Italian version of a pre-dinner, but Stranieri (foreigners) sometimes want to eat a full meal of it. 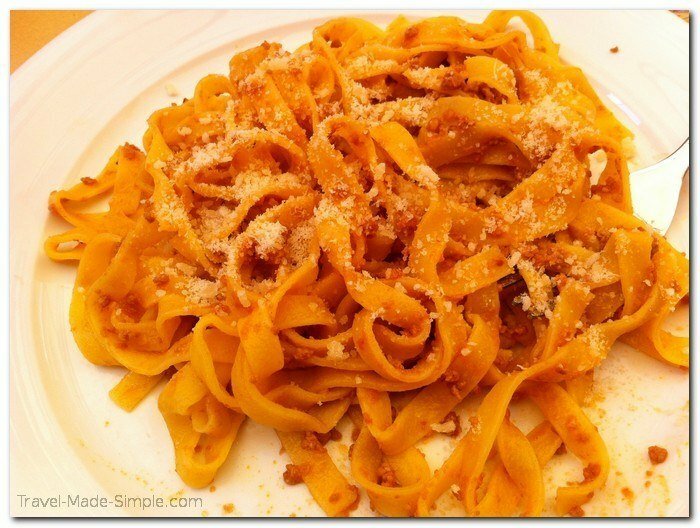 Looking for a food tour in Rome? We’ve taken this one and this one, and we loved them both! This is just a taste of things. Food in Italy is such a wide and varied topic that no single post can cover even a tiny sliver of it. But hopefully this gives you a bit of insight and a few little pieces of info to make eating in Italy more enjoyable. Why no join one or more of our members in Italy to cook and eat local everyday food with them? It doesn’t cost anything and you’ll remember it as one of the est experiences in the country, i bet! Enjoy! Thanks Kris, looks like a fun project you have there! There is some really good advice in this article. 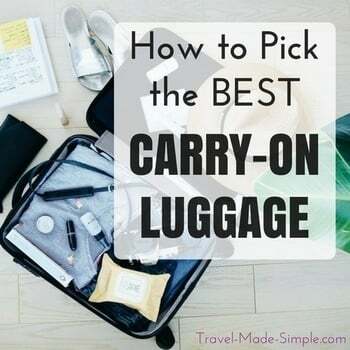 I would like to add that in addition to the wise advice given about finding where the locals eat in terms of getting good food, there are often substantial savings to be had by finding where the best local eateries are. Often the restaurants pitched at toursts are “tourist traps” in that they are stereotypical in what they offer and are often highly overpriced compared to what the locals are offered in comparison. This is true the world over from Italy to Germany to Thailand even to Australia. Just take Melbourne, Australia as an example. There are burger joints in Melbourne that will charge you up to $20 AUD just for a burger, not even the sides. However, if you disregard these tourist traps and know a few locals and a handy with Twitter, you can come across @beatboxkitchen – a mobile burger joint that offers some of the best burgers you’ll ever taste in inner city Melbourne and without all the touristy hype and overheads that accompany many of the burger joints in the city. If you’re prepared to do without meat altogether, Om Vegetarian on Elizabeth Street is $6.50 all you can eat between 11 and 9 daily. 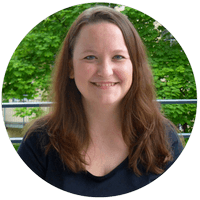 So it really pays to do your homework before you go to your destination, especially if you have dietary requirements that you need to consider. I completely agree, Matthew. Finding the restaurants that don’t specifically cater to tourists means better food and lower prices. We try not to eat too close to the tourist attractions, just as a start. Also, staying in apartments is usually a good way to end up in a neighborhood that has non-touristy restaurants. If I ever make it back to Melbourne, I will *definitely* be asking you for advice on where to eat! This will be so helpful for when I’m in Italy in October. I am so ready to eat my way through Rome. Thank you! Thanks Lauren! Enjoy your trip to Italy! 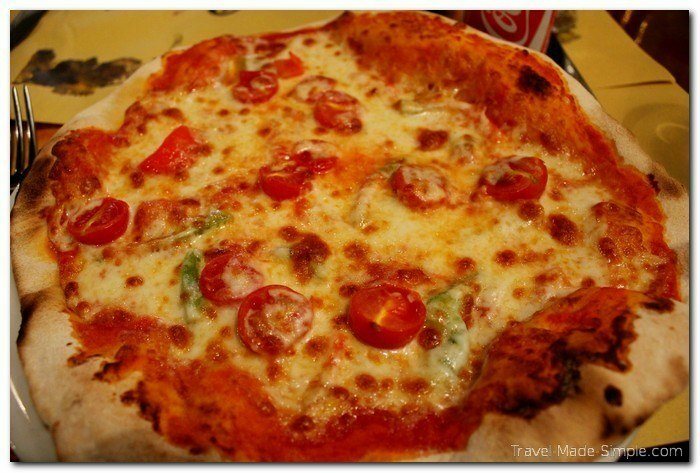 Ohh my, you should never eat a pizza if you are not at Naples or if you crave for it, search for a napolitan pizzeria because it is the best pizza. As well as the carbonara is the best from Rome. I actually like the Rome style pizza better than the Naples style, but I know I’m in the minority! Thanks Maria!